This Saturday at UFC 190, Brazil’s undefeated Bethe Correia gets what she wanted after challenging reigning women’s bantamweight champion “Rowdy” Ronda Rousey following back-to-back victories over the champion’s “Four Horsewomen” teammates. Considered by many to be the most dominant champion in UFC history, Rousey aims to defend her crown for the sixth time. 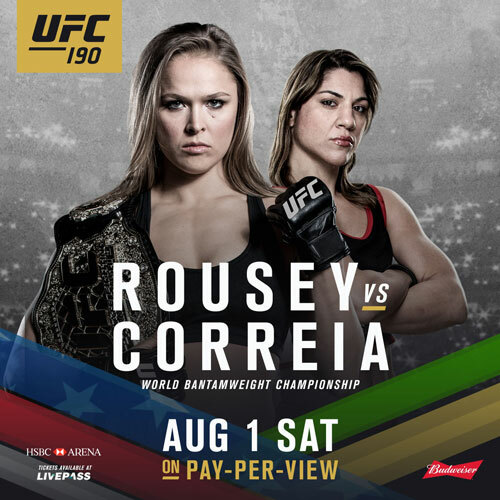 Order UFC 190: Rousey vs. Correia – live on Pay-Per-View this Saturday at 10pm/9c…Monster Octagon… official headphone of the UFC & the headphone worn by Ronda Rousey and Anthony “Showtime” Pettis. Get yours now at www.monsterproducts.com.